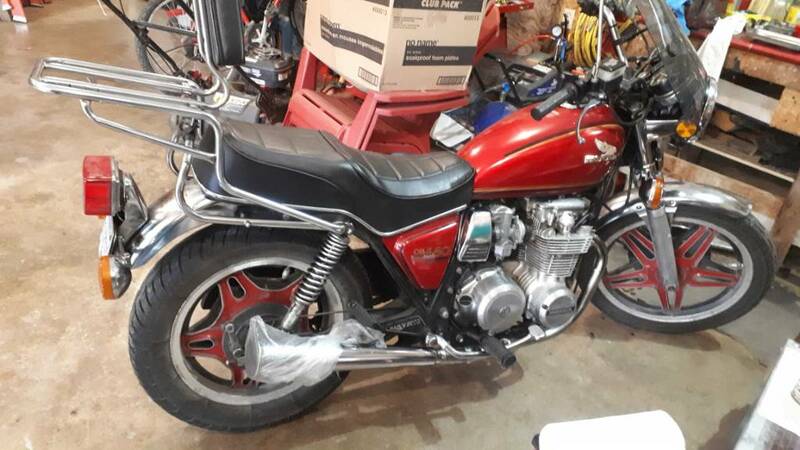 My son has a 1980 CB650 and it needs an engine. It has mechanical carbs, would the CV carb engine bolt on my frame? What year engines will work on his bike? I just done a search on this site.. It looks like only a 79 or 80 will work. But I did read that my head will work on a 81 or 82. Is this true? I got a brand new late head, i would sell. I think the heads interchange if you have the right carbs.. It would help to know what bike you have to offer compatibility advice. Edit: it should fit in the frame. Currently there’s a ‘79 engine in my ‘81 bike. The manifolds for the carbs are cast into the heads. That's pretty much the only difference in the SOHC4 CB650's. If you have a good bottom end and good head/carbs, just make one good engine. Ok, so you can get an 81 or 82 engine and use the head and carbs from your bike. Or you can get an 81 or 82 engine and use the carbs from that bike. Or you can just get a 79 or 80 engine. I added oil to each cyl. Throttle still wide open. Those seem OK to me. All 650 SOHC motors will fit in any 650/550/500 frame but the carbs may interfere with the tank/petcock. The 79&80 head spigots are spaced differently than the 81&82 head spigots. Two later years got CV carbs where the two earlier got PD mechanical slide carbs. The heads can swap between all 650’s. Is this bike missing an engine or are the compression numbers from the engine it has and you felt that it’s low and needs work? As said above, those numbers look good. If that’s the only thing you we’re worried about I would just do the 3k mile service and run it. Those r my numbers. I done it last evening. The bike acts like it hits a wall just after the throttle leaves idle. It doesn't do it all the time which really bugs me. Then when I get it up to 5th idling along the bike almost surges. That sounds like carb issues. Maybe ignition, but sounds more like carb. Have you pulled them apart and done a good rebuild? It also has an accelerator pump that you may want to look at. Are you running the stock air filter? check the ignition advance and the distance of the pickups. Here we go with my findings. Gas cap had no difference. -Torn carbs off again and untra sounds each one individually. I did not check the valves as I done them 4 to 5 times over the past year or so. Went for a small drive after work today.. It seems to be cured.... Rain tomorrow but I'll try another day. I should say but I think the pulser generators were out a little bit. Very nice. So, you think it was the adjustment on the pulsers? Day 4 is done... absolutely fixed. Yes the only thing I can say is ' I adjusted the pulsers'. Recap . When taking off the bike would make a big dive and stall most times other times I had to rev and rev to 2 to 3k and ride the clutch.